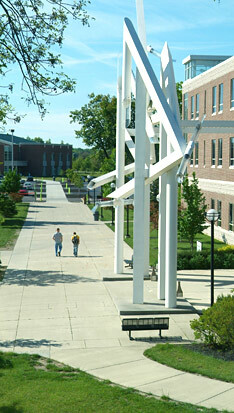 The Northwest Ohio Allied Health Consortium is composed of four higher education institutions: Rhodes State College (Lima); Marion Technical College (Marion); Northwest State Community College (Archbold); and Clark State Community College (Springfield). The consortium combines the resources of the four member institutions to provide you with more degree options and a seamless educational experience. You can complete a degree in an allied health program offered at a consortium institution by attending the institution closest to you. For example, if you want to become a respiratory therapist but your local community college doesn’t offer this degree program, you don’t have to engage in an arduous commute or give up your dream. Through the consortium, you can attend classes close to home and obtain your associate’s degree. You can take general education courses locally and program courses (offered at the distant college) via live video conferencing broadcast while sitting in a classroom at your local college. Your clinical requirements would also be completed at local hospitals and healthcare facilities. You would only need to travel to the distant college for some laboratory work. Respiratory Care Program through Rhodes State’s degree program is available to Clark State Community College, Marion Tech and Northwest State students. Radiographic Imaging Program through Rhodes State’s degree program is available to Clark State Community College and Northwest State students. Medical Laboratory Technician Program through Marion Tech’s degree program is available to Rhodes State and Northwest State students. Occupational Therapy Assistant Program is available through Rhodes State’s degree program to Clark State Community College and Northwest State students. Health Information Technology Program through Marion Tech’s degree program is available to Rhodes State and Northwest State students. Convenient. You don’t have to travel a long distance to major in the allied health field that interests you. The consortium enables you to major in an allied health program offered at another institution by attending your local institution and participating in courses via long-distance education. Also, clinical experiences are conveniently arranged with local hospitals and other health care facilities near you. You will need to travel to the degree-granting institution for some laboratories or classes. Cost-effective. The cost of the program is reasonable. Supportive. Admissions counselors walk you through the enrollment process and instructors and administrators at each institution care about your success and are supportive throughout the program. Success. Workforce statistics show that allied health professionals are needed to work at hospitals and healthcare facilities across Northwest Ohio. Completion of a degree program offered through the consortium can lead to a job offer close to home. You’ll be on your way to an exciting career with financial stability and personal growth. Aside from opening the opportunity for a career in healthcare after only two years, you can also explore other options including continuing your education at a four year institution. Some employers even offer to help pay for ongoing education and training under tuition assistance programs. Anyone wishing to continue their education can also apply for scholarship funds that are offered by professional associations.